More than a year’s detailed consultation led to a recommendation for a new mitigated northern route with a ‘reasonable alternative’ of significant and sensitive improvements to the current line of the road to the south of the city. Transport Secretary Chris Grayling answering Chichester MP Gilllian Keegan's question on funding for the A27 in the Commons (photo from Parliament.tv). But writing in today’s Chichester Observer, the leader of West Sussex County Council Mrs Louise Goldsmith revealed that Highways England has said that neither option was ‘affordable or workable’. Gillian Keegan has been asked by the county to seek an urgent meeting with Transport Secretary Chris Grayling to discuss the issue further – a move supported by both the district and county councils. 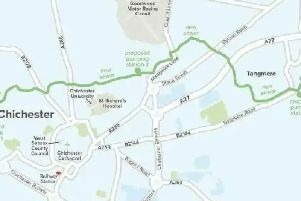 Chichester desperately needs an improved A27 as more and more housing regularly brings traffic to a standstill potentially costing the economy many millions of pounds. An original consultation by Highways England was mired in controversy and resulted in Mr Grayling unilaterally axing the original options on the table. One of the reasons he gave was the lack of community cohesion around any one scheme – in the consultation more people backed ‘none of the above’ than any shortlisted option. Mrs Goldsmith said: “Mr Grayling said he cancelled the scheme because the councils and community did not agree. Since then, working through BABA27, both councils have clearly set out their jointly agreed support for the mitigated Northern option. “We all know and appreciate that Government has a very big issue at the moment but this matter is extremely important to everyone living and working in the area, as well as further afield. I hope we can have a meeting with Mr Grayling to reassure him of our joint agreed position. Read West Sussex County Council leader Louise Goldsmith’s reaction here.